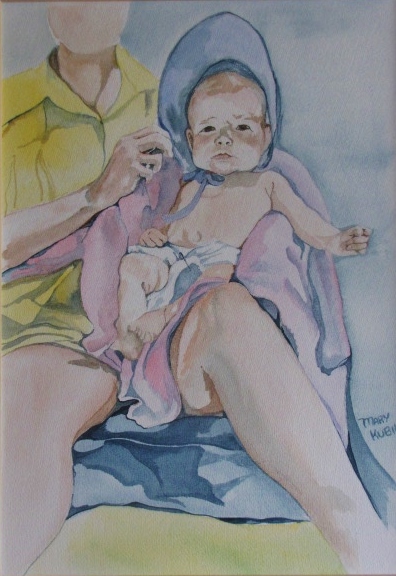 This is a watercolor of my Mother holding my sister, Karlin. My Mother’s form was not completed with detail, but instead was used a stabilizing and supporting element surrounding the baby. Notice how the arms and legs of the mother leads you into the area of focus; the child. So good to hear from you, Marian and your kind remarks!! It is watercolor, however, I use dry brush to work in the details. Kind of approaching watercolor as drawing in the various stages of washes. Hope all is well with you!! You are currently reading Using Form as Framework at Dr. Mary McNaughton and Drawing.